I’m happy to report that my iritis is healing well. Wednesday I had my check up at the hospital and they said my eye looked much better. 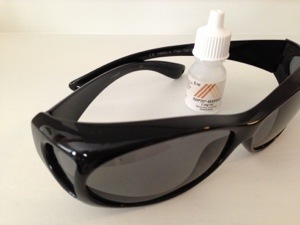 I was told to stop using the “nasty” eye drops–okay, that was not their official word describing the eye drops called Cyclogel–which gave me so much trouble with blurry eyes and sensitivity of light. My pupil is almost back to normal again! I will have to continue with the cortisone eye drops for three more weeks, but for each week I will lower the amount of drops I need to take. In mid September it’s time for a check up again. So, iritis, is an autoimmune disease just like RA. The eye doctor claimed that if you suffer from one autoimmune disease it’s easy to get other ones. Need to check on that with my rheumatologist. Makes me a little concerned for my health. How many autoimmune diseases can/will I get!? Obviously no one can answer that question but I need to check up with my doctor anyway. I’m still needing my fabulous new sunglasses as soon as I’m outside and sometimes even when I’m inside depending on the lighting, BUT, I am getting better which is fantastic! It’s always nice to be on the mend. I”m glad you’re doing better. xo I just got a shot of cortisone in my arm and tha’ts slowly coming good again. Then it will be off to the hospital for a shot of much the same in my other arm…. good job my bank balance is resiliant! It costs about $250 a pop after the government reimburses me.